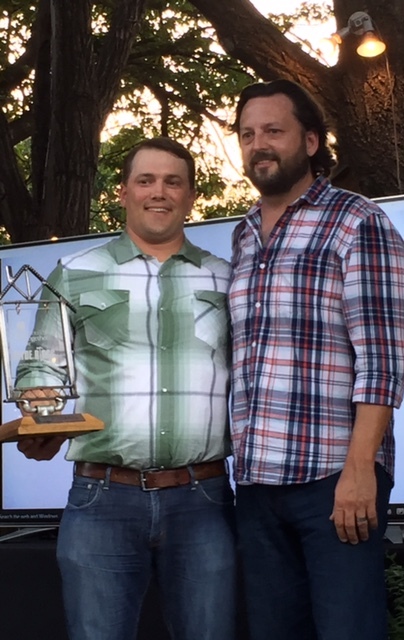 Manhattan Construction Company Project Director Clay Cockrill has been selected by Rebuilding Together OKC (RTOKC) as the recipient of the 2016 Clyde Riggs Volunteer of the Year Award. Rebuilding Together OKC brings volunteers and communities together to improve the homes and lives of low-income, elderly homeowners in the Oklahoma City metro are. Every year the organization hosts a Barn Raising Bash which benefits the nonprofit with funds going towards the purchase of supplies for the home repairs and safety modifications for seniors. Clay was recognized at this year’s event for his volunteer efforts which helped raise a total $65,000 for home repairs. Clay has been a member of the board of directors for RTOCK since 2010. He has been a strategic member of the organization and has helped reconnect his church after being absent from active participation with Rebuilding Together OKC. His efforts not only lead to the re-engagement of church volunteers, but he also recruited Manhattan Construction with its numerous volunteers to the Rebuilding Together program. He also serves as co-chair of the annual golf tournament and is responsible for the children’s care and special event at the annual construction derby event. Clay has 20 years of construction industry experience including MAPS and MAPS for Kids, commercial building, higher education and aviation project types. He serves on the boards of directors for The Oklahoma Quality Foundation, and the Leadership Oklahoma City Alumni Board. He is the Oklahoma City Rotary Club 29 Service Saturday committee chair and is also involved with the Greater Oklahoma City Chamber of Commerce, University of Oklahoma Club of Construction Science and Church of the Servant United Methodist. He is a 2011 OKCBiz Magazine Forty Under 40 honoree. Clay graduated from The University of Oklahoma with a bachelor of science in construction science in 1999. You are currently browsing the Manhattan Construction Group blog archives for June, 2016.